OLD PARKED CARS. 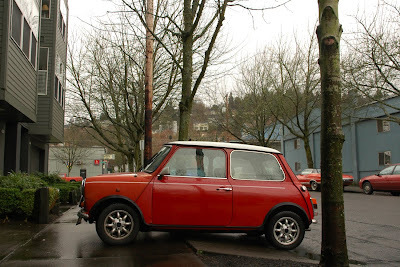 : 1986 Mini Cooper. Torino previously seen around the corner. That's a second-generation Montero in the background. I had a gray/black '93. It looked like an insurgent vehicle. What about that 1st gen Torino in the backgroud of 3rd picture? It's an 1985-1986 model, the UK licence plate under the US one is a C reg which is Auguat 1985 to July 1986. Weird, the guy I talked to said it was a 69 but was titled as a 72. Or vice versa. Vracktal, your info sounds pretty hard to deny. They're usually titled as older models to get around the 25 year restriction. I would say that's definitely an 80s car. C reg cars are definitely as Vracktal says. If the number plate was the other way round, the H at the end could refer to a 1969 car but its definitely a more modern number plate than that. 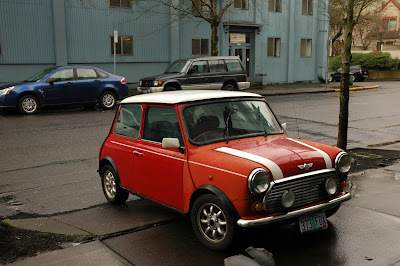 Also the side indicators don't seem to be there on 60s cars. That Torino is definitely OPC'able. Like the mismatched pass. 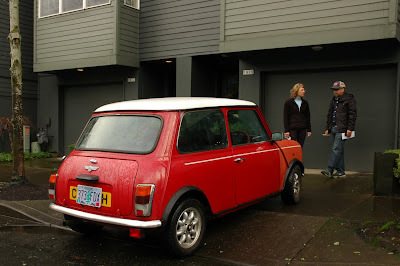 side fender on the Mini, gives it personality.